The smell, the taste and the gorgeous flowers that grow on the vine, it is one of my favorite fruits. My neighbor here in LA has the biggest passion fruit plant and I am always looking to see if they need to find a good home for those extra passion fruits. 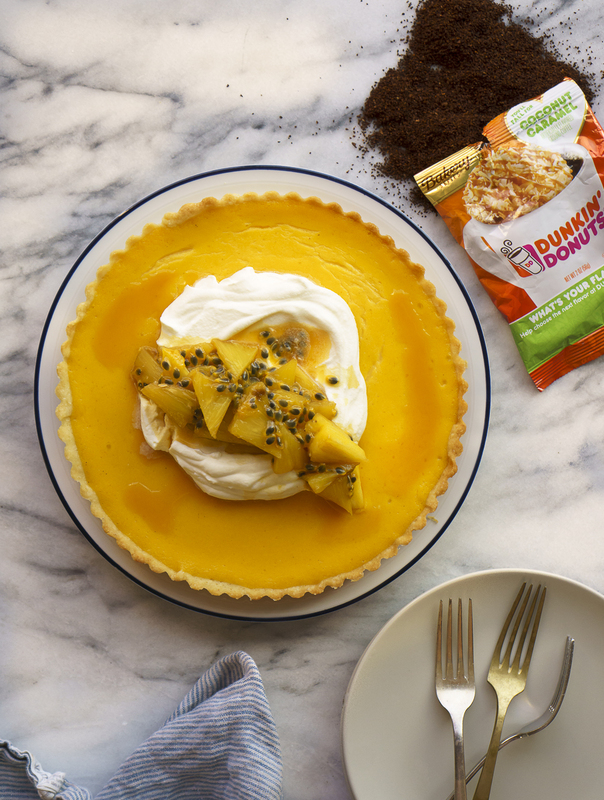 Today, I am pairing Dunkin’ Donuts Bakery Series’ Coconut Caramel flavor with my Passion Fruit Tart with Caramelized Pineapple. 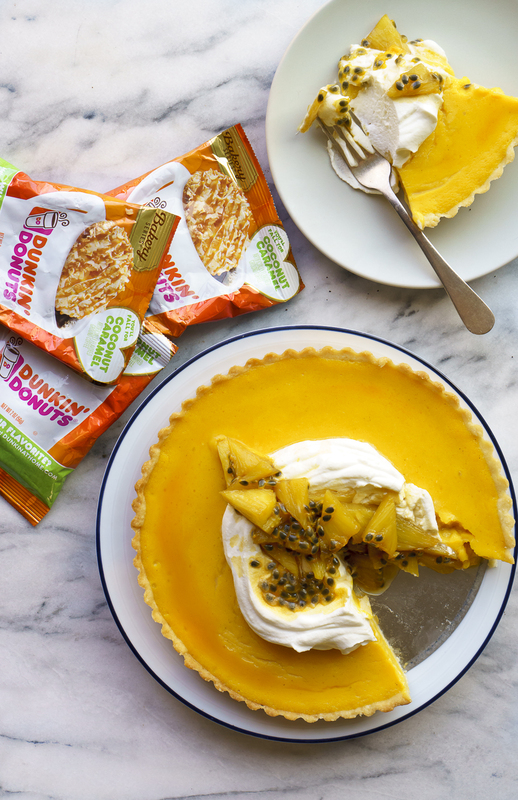 The coconut in the coffee and the passion fruit in the tart pair perfectly. Not to mention they smell heavenly together, if you close your eyes you might just think you are on an exotic tropical vacation. If you missed the last post here is the deal. Dunkin’ Donuts Bakery Series is coming out with a new coffee flavor next year and they want our help picking the winning flavor. There are three new flavors, Blueberry Pancake, Dulce de Leche Cookie, and Coconut Caramel that you can test and then vote for your favorite online. Make sure to head on over to their website and vote for your favorite coffee flavor. You have until October 31st to enter your choice, plus a chance to win $5,000 or a year’s supply of the winning flavor (think of all the cups of coffee!!). The best part, you can totally help choose which flavor will be in stores next May. Stay tuned for some another tasty dessert recipe headed your way when I pair the last of the three flavors, the Dulce de Leche Cooke. Add eggs, yolks, sugar, passion fruit juice and salt to a medium sized heat resistant bowl. Place the bowl on a sauce pot filled with 3” of simmering water. Cook the egg and passion fruit mixture for about 10 to 12 minutes or until the mixture coats the back of a spoon. Add the butter and stir until smooth. Pour the passion fruit curd into the pre-baked tart shell. Bake the tart for 10 minutes or until the center is just barely set. Remove the tart and let it cool to room temperature. Cool in the refrigerator until filling it set. When ready to serve make the pineapple. Add the pineapple and sugar to a medium sauté pan over medium heat. Cook the pineapple for about 5 minutes or until the sugar has started to caramelize. Add in the vanilla and the fresh passion fruit. Let mixture cool. Assemble the tart by topping with a dollop of whipped cream and a spoonful of the caramelized pineapple.